Without a doubt, Mineral Sea Lava Explosion owns the title of Favorite Material among my customers. A swirling mix of blues, blacks, and golden orange with some pearly chatoyance, this material comes from the talented hand of Eugene Soto of Muttblanks.com. This past week, a writing duo in Mineral Sea came to life. The Oversized Zephyr makes quite a statement with its girth and bold coloring. The Literati Academe Dip Nib Holder draws the eye to its unusual feature of a cap, which is rarely seen on a dip pen. I just recently took a Copperplate calligraphy class, and saw the advantage of a dip pen with a cap for better portability. Of course, there aren’t any caps for oblique dip pens. Completing this desk set is a two slot pen rest. 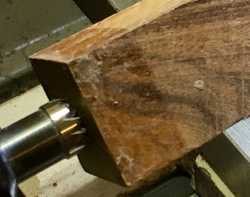 Normally I make one slot rests, but this customer wanted 2 slots to accommodate both pens. 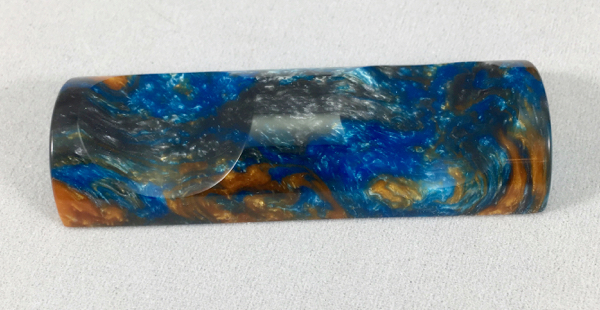 Another Muttblanks material landed on the lathe this week : Sunflower Sky Lava Explosion. Its whirling blues, yellows, and black resemble Van Gogh’s Starry Night painting. A black ebonite section enhances the grip and breaks the wild color of the rest of this clipless Idyll. Here’s a sneak peek at a new project I’m working on. Whatever could it be?